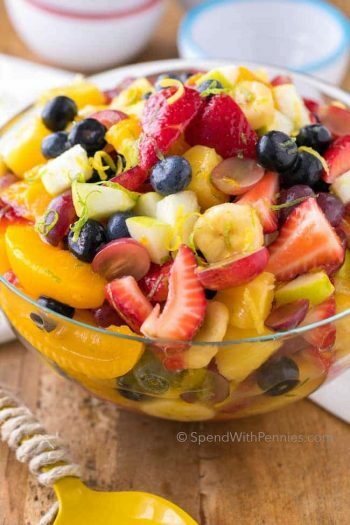 Fruit Salsa is a dessert meets dip that nobody can resist. 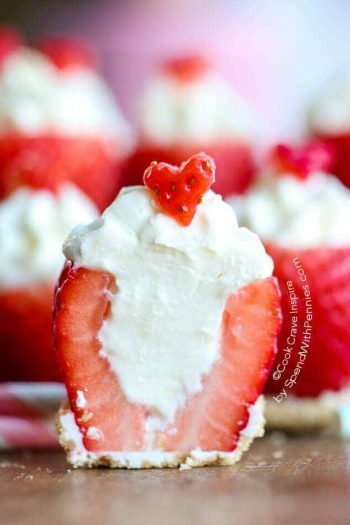 Loaded with fresh fruit and berries this is the first thing gone at every party! Serve this along side our favorite oven baked cinnamon crisps for dipping, this is going to be your new go-to! Fruit Salsa is a recipe I’ve been making pretty much forever. 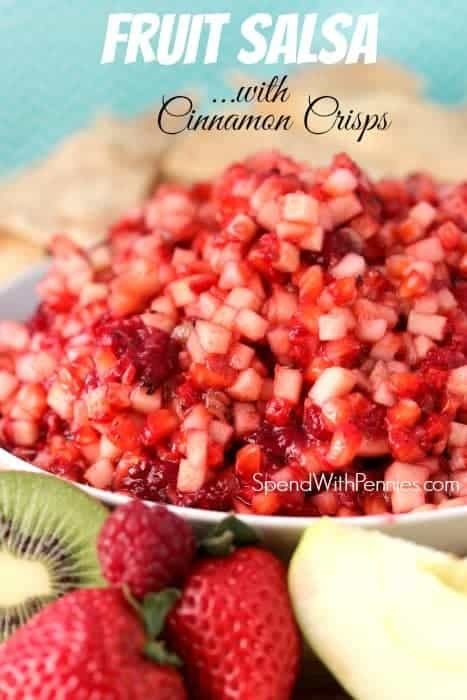 This isn’t a typical salsa in the sense that it doesn’t have any savory notes to it (like cilantro or onion), it’s more like a sweet berry fruit salad in a scoopable form. It’s the perfect light summer snack or appetizer and a delicious treat to serve at a potluck or bridal shower (and I always seem to have to double the recipe)! 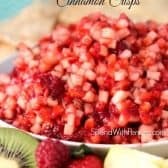 This recipe starts with ripe juicy berries and fresh summer watermelon and then I like to add in diced apples for a little bit of crunch. You can certainly add in any kind of fruit to this recipe, kiwi, pineapple and mango are amazing in this recipe too! There is a bit of chopping involved in this recipe, I used one of my favorite kitchen tools to make it super quick! This chopper has saved me countless hours in the kitchen; I use this thing to cut everything… salsa, chili, peppers, onions… you name it! LOVE this thing! The cinnamon crisps can be made up to 4 days ahead of time, cooled and stored in an airtight container. I usually spray them with cooking spray but you can also brush them with a bit of butter if you prefer. 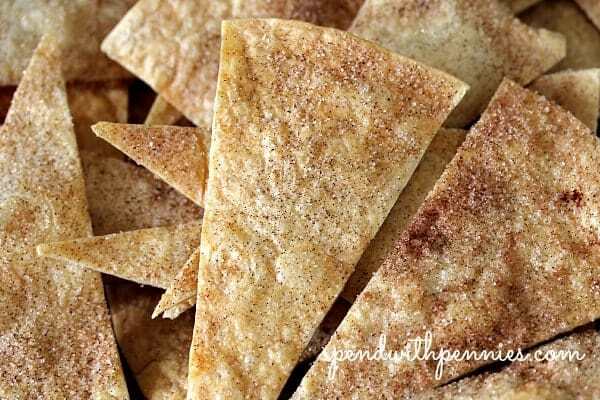 If you don’t want to make your own cinnamon crisps, you can serve this with store bought cinnamon sugar chips for scooping. We also sometimes spoon it over ice cream or onto angel food cake (especially if we’re lucky enough to have leftovers because if it sits overnight the fruit releases juices). 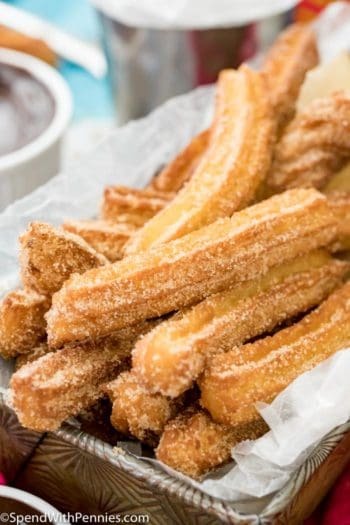 It’s amazing how something so fresh and simple can be so delicious, and my kids most certainly think of this as a treat! 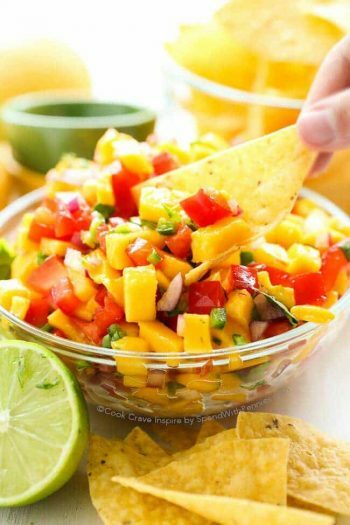 Fruit salsa is the perfect dish for any occasion and can be served as an appetizer, snack, dessert or really any ol’ time of day! 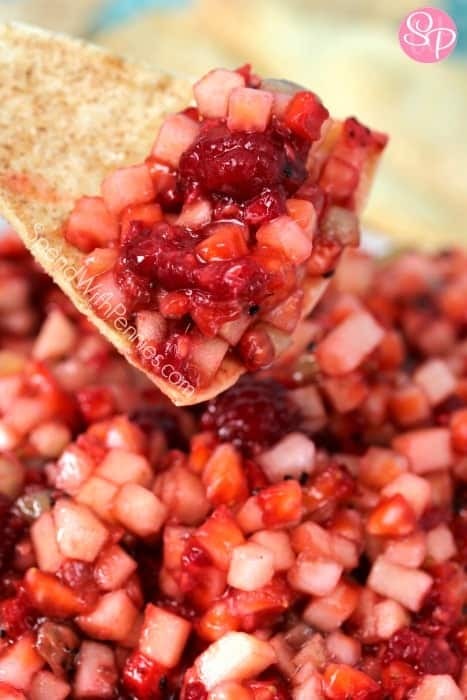 Fruit Salsa is a dessert meets dip that nobody can ever resist. 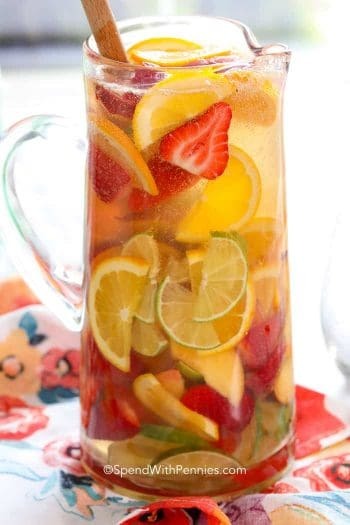 Loaded with fresh fruit and berries this is the first thing gone at every party! Serve this along side our favorite oven baked cinnamon crisps for dipping, this is going to be your new go-to! Preheat oven to 350 degrees. Combine cinnamon & sugar. Set aside. Working with 3 tortillas at a time, spray both sides of of the tortilla and sprinkle each side lightly with cinnamon sugar. Stack 3 tortillas and using a pizza cutter, cut tortillas into 12 wedges. Place on a baking sheet and bake 8-11 minutes or until crisp. Zest the lemon and set aside. Peel and finely chop apple, squeeze 2 teaspoons lemon juice over apples and mix well to combine. Finely chop strawberries and melon (or kiwi). Gently combine all ingredients, the raspberries will break apart a bit. Allow to sit at room temperature at least 15 minutes before serving.